ed up within three weeks, un­less complications should de­velop. But we now know from the first it was Acute Hepatitis—no doubt the liver finally giving way from the severe beatings the kidneys had received from those three operations. The Jaundice, and Toxemia could have been thrown off per­haps had his kidneys been healthy and strong. 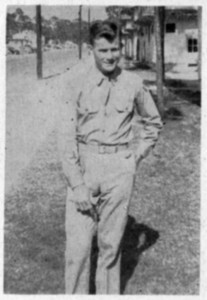 Soldiering at Keesler Field Spring of 1945. On Thursday, Jan 16th. Payne and Bettie and I went to Fayetteville to see him. He was feeling pretty good, and was making Poppies (to be sold on May Day). He said he would soon be out and back in college; just before we three left him that Thursday afternoon, he im­pressed me to phone his beloved friend, Mrs. A. McCullen (who will be 86 Oct. 3rd and who he visits every Sunday when he is here) that the reason he hadn’t written her since Jan. 3rd was because he was so busy getting down to his studies. Well, we came home feeling good about him. (On the first two trips, Betty, my wife, could not go as she was kept at her duties at the high school, where she teaches the Commercial courses). But next day, Friday, Jan. 17th, at 12:30 I had a wire from the Veterans Hospital that he was in a critical condition. The Toxemia had progressed and simply had slowly but surely enveloped him so that by the time Payne, Bettie and I got to the hospital in late afternoon, he was in a semi-coma. However, he roused when we spoke to him and knew us. At this time he was bothered with hic­coughs; and the only relief was to use a gas-mask with carbon dioxide on him for ten-minute periods. Payne and Bettie came home that night. I remained in the hospital with him. Next day, Saturday, he was in a more profound coma. X-Rays were taken to make sure there were no stones in kidneys or gall-bladder; they were clear as well as his chest; but the Toxemia continued, and worse. However, at noon Saturday he roused when Rev. Ralph Bridges, his rector, came to see him, and murmured his name. Again at dusk, when the regu­lar intravenous injections of glucose, etc. were being given him, he roused for a moment and saw me and said, “what you doing here, daddy?” and lapsed back into his coma. Sunday he was in an even more profound coma. At noon Betty, Payne, Bettie and Wm. Everett and Ed Hurst came. It was realized then that the Toxe­mia had gotten the best of him. William Everett remained with me; the others returned to Rockingham in late afternoon.